Hotels Under Construction or Announced for Wake County, N.C. This 90-room hotel is planned for 12501 Retail Dr., Wake Forest, NC. This is a project of Eastern Properties of NC. Status: The projected opening is October 2019. 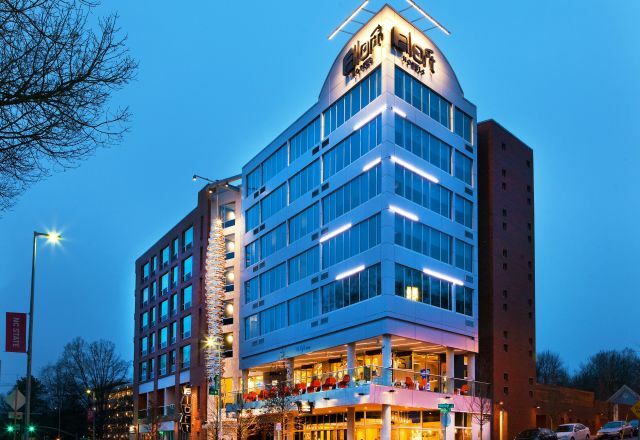 This 126-room, 7-story boutique hotel will be located at 1 Glenwood S. in downtown Raleigh. This is a project of Schulte Hospitality Group and Thrash Group. This hotel will include a wine and tapas restaurant, juice counter, gym, bike sharing and meeting space. This 153-room hotel will be located between Dillard Dr. and Jones Franklin Rd., Raleigh, NC. This is a project of Waterwalk Hotel Apartments. Status: The projected opening is December 2019. This 152-room, 6-story hotel is planned to be a part of a mixed-use development at 1001 Wake Towne Dr., Raleigh, NC. Midtown East Hotel LLC will manage the hotel. Status: The projected opening is April 2020. This 250-room, 18-story hotel is planned for 4501 Creedmoor Rd. This is a project of Starwood Hotels Marriott and Shamin Hotels of Chester, Virginia, called the Soleil Center. This will be a luxury hotel and conference center with a rooftop bar, ballroom, meeting space, and full-service restaurant. Status: The projected opening is February 2021. This 180-room hotel is a project of Kane Realty Group, included in part of their expansion of the North Hills area. This will be a part of Walter Tower, including a ballroom, restaurant, bar, meeting space, and outdoor areas. Status: The projected opening is July 2021. This 155-room hotel is planned for 5410 Wade Park Blvd. Status: The projected start date is May 2020 with target opening date of December 2021. This 124-room, seven-story hotel is planned for Willard Pl. and Glenwood Ave. in the Glenwood South downtown Raleigh district as part of The Willard development. This is a project of 21 Glenwood Partners and Summit Hospitality. Status: The projected opening is November 2021. This 45-room hotel is planned for 615 W. Peace St. Currently, this is an unbranded hotel. This is a project of MJM Group. Status: The projected opening is February 2020. This 176-room hotel is planned for part of the 301 Hillsborough mixed-use project, also including office space, residential units, and retail space. The site plan will encompass almost a whole block between Hillsborough and Dawson streets. This is a project of The Lundy Group and Hyde Street Holdings. The architect for the project is Rule Joy Trammel + Rubio. Status: This project is in final planning with no current set opening date. This 82- room hotel is planned for 3401 Sumner Blvd. Status: The projected opening is December 2022. This 180-room 12-story hotel project will be located at 431 S. McDowell St. This is a project of Winwood Hospitality of Raleigh. This hotel would include a street-level bar and café, an elevated lobby and a pool area above structured parking. There will also be 600 square feet of meeting space. This space is currently a single-story building leased to Enterprise Rent-A-Car. This 130-room hotel project will be located at Dillard Dr. and Piney Plains Rd. in Cary, NC. This is project of Marriott International. This duo hotel project is planned for N. Harrison Ave. and Weston Pkwy. The Courtyard would be a 121-room hotel while the Springhill Suites would be a 109-room hotel. These hotels would share a lot and lobby as a joint project under The Daly Seven. Status: The projected opening is May 2021. This 150-room hotel project is planned to be between U.S. Hwy. 70 and Jones Sausage Rd., Garner, NC. This is a project of Drury Development Corp. Status: This project is in early planning with no current set opening date. This 105-room hotel is set on a 20-acre property at 804 Airport Blvd. near the intersection with Perimeter Park Dr. Eco-conscious element branded hotels contribute to sustainability through paper recycling bins in each room, recycled materials in carpets and low VOC interior paints. This property is owned by OHM Hotels. This 85-room hotel is planned for U.S. Hwy. 70 and McCormick St. This is a project of Aiken&Yelle Associates. Status: The projected opening is December 2020. This 107-room hotel is planned for 1000 Winstead Dr. This is a project of East Coast Hospiality and The RBA Group. This 259-room, 13-story hotel is planned for 200 W. Davie St. This is a project of CN Hotels Inc. of Greensboro with Godwin Associates PA as the architect. Status: The projected opening is February 2022. This 10-story and 190-room hotel is planned for 10100 Lumley Rd. This is a project of Winwood Hospitality Group. This hotel will include a parking deck and restaurant. There will be 4,500 square feet of total meeting space between this Hilton and the joined Homewood Suites in this location. Status: The projected opening is April 2021. This 115-room hotel is planned for 312 Hwy. 70 E., Garner, NC. Status: The projected opening is July 2020. This 85-room hotel is planned for 1000 Winstead Dr. This is a project of East Coast Hospitality. This 192-room (96 rooms each) duo-hotel project is planned for 603 S. Wilmington St., Raleigh, NC. This is a project of Narsi Properties. Status: The projected opening is March 2021. This 110-room hotels is planned for 6110 and 6114 Corporate Ridge Rd., Raleigh, NC. This is a project of Oaks Hospitality, LLC. This 96-room hotel is planned for 3951 Sumner Blvd. This is a project of North Raleigh Hospitality, LLC, and 161 Architecture. Status: The projected opening is June 2021. This 135-room hotel is planned for 10100 Lumley Rd. This is a project of Winwood Hospitality Group. There will be 4,500 square feet of total meeting space between this Homewood Suites and the joined Hilton in this location. This 6-10 room boutique inn will be created from an 1858 Italianate style mansion in the Boylan Heights neighborhood in downtown Raleigh. Status: The project is currently in the rezoning process with a projected opening of 2020. This 200-room, 9-story building has been proposed for 221 W. Martin St. across from Nash Square. This is a project of Raymond Management Company. This will include a restaurant on the ground floor. Status: The project is currently in the planning process. This 93-room hotel is planned for 1109 Markham St., Apex, NC. This 105-room hotel is planned for 8001 ACC Blvd. This is a project of Dakota Legacy Group. Status: The projected opening is June 2020. This 105-room hotel is planed for 1021 Carrington Mill Blvd. This is a project of Carolina Perimeter Hospitality LLC. This 91-room hotel is a Marriott project planned for 3771 Thistledown Dr. This is a project of Nine Points LLC. This 84-room hotel is planned for Hampton Way Dr. This is project of Milkam Hospitality Management and 161 Architecture. This 100-room hotel will be located in Morrisville, NC. This is a project of Waterwalk Hotel Apartments. Status: This project is currently in the planning process. This 228-room, 10-story hotel is planned for Glenwood Ave. and Macaw St. This is a hotel project of CMC Hotels. Status: The projected opening is August 2021. Located at the interchange of U.S. 401 and I-540. Mixed use development of 1,200-1,400 homes and apartments, along with 1.6 million square feet of offices, retail, restaurants, movie theater, plaza area for concerts and a 250-room hotel. Project was approved by Raleigh City Council 1/9/07. Contact: Jimmy Barnes, NAI Carolantic Realty, Inc., NAI Carolantic, PO Box 1550, Raleigh, N.C. 27602, 919.832.0594, jbarnes@naicarolantic.com. This Master Plan was approved at the 6/5/12 Raleigh City Council meeting. The proposed plan was a request to rezone 38.5 acres to accommodate a mixed-use development consisting of office space, 600 residential housing units, 115,000 square feet of retail space and a possible 300-room hotel. There would also be two parking decks. The project would be a total of 1.63 million square feet. Developer is American Asset Corporation, 3700 Arco Corporation Prkwy, Ste. 350, Charlotte, N.C. 28273, 919.821.2700. This Master Plan was approved at the 7/3/12 Raleigh City Council meeting. The boundaries are Crabtree Valley Ave., Blue Ridge Rd. and Homewood Banks Dr. The proposed plan will include 500+ residential apartment/housing units, 15,000-to-60,000-square-feet of retail space includes a restaurant, 250,000 square feet of office space, a parking garage and a 200-room hotel. First part of project would be 293 apartments. Other development (office space, retail space and a hotel) would follow in phases over a three-year period. The land owner is Redus NC Land, LLC, 3563 Philips Highway, Ste. 601E, Jacksonville, Fla. 23058. The developer is Pappas Properties LLC, 1111 Metropolitan Avenue, Ste. 325, Charlotte, N.C. 28204, 704.716.3900. Status: Construction began on first part of project July 2013.